I assembled the Iceni 70cm transverter kit from G4DDK. Instead of the ADE-13 i used a ADE-751MH+. Sam was so kind and sponsored one of his mixer samples he used for testing. Unfortunately the manufacturer of the mixers uses different pinouts for almost every type. In this case i had to swap RF and IP ports. The good one: It is not difficult with the layout. In the picture you can see the short semirigid. 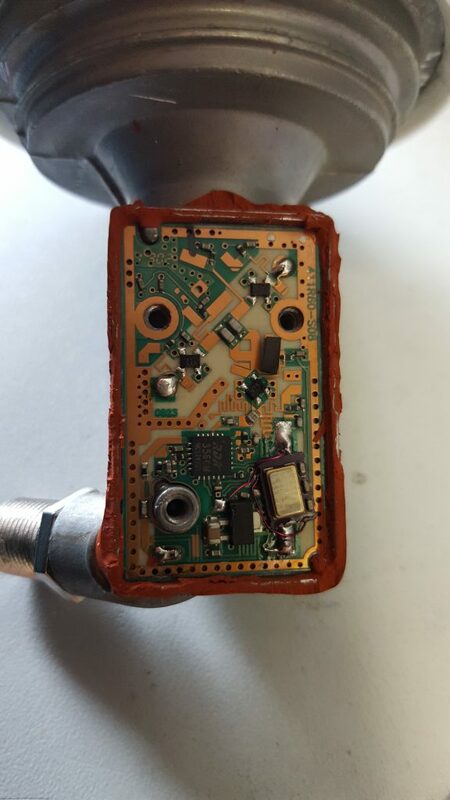 The next picture shows some IM3 measurement for the RX part of the transverter. 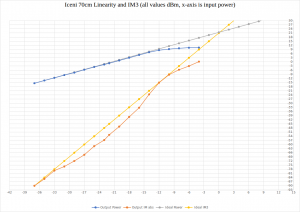 The estimated input IM3 point is around 0dBm now (21dB gain). 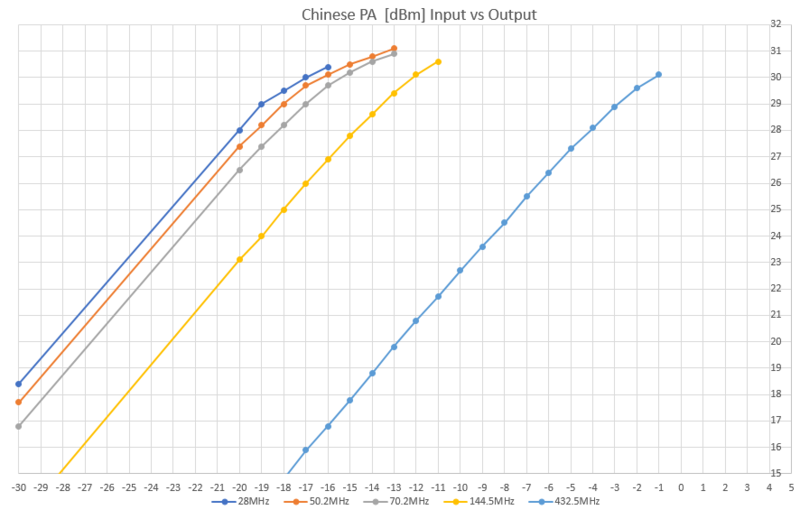 The P1dB is about -9dBm (2x -12dBm). I also checked the output signal. 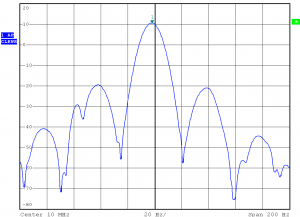 The 2nd harmonic is about 53dB below wanted signal and the LO suppression is about 58dB. So some extra filter might be required to the comply with regulations. Overall i am very satisfied with this transverter block. With the alternative mixer the performance is even better than it was before. I was searching for a small driver for 2m in order to have enough power for my microwave transverters. I usually drive them with about 500mW. Since i have a transverter block with about 0dBm output it needs some gain. Again i found something from China. 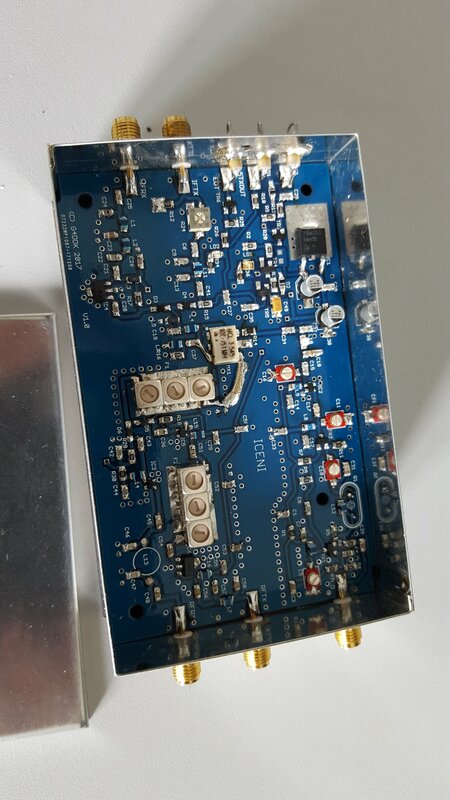 The advertisement told something about 1.5W, the pictures showed a PCB with a print 35dB/3.2W. However, i thought it could be good enough to get 0.5W out of it. At the input there is a 6dB attenuation pad which are followed by two amplifier stages of unknown type. The first stage is supplied via a 5V regulator, the second one is connected to the supply input directly. I used 12V to do some measurements. The first action was to know the gain of the circuit. I wanted to see if it is really working from 1 to 700MHz. In the picture you see the little noisy measurement. The drive from the analyzer was set very low. 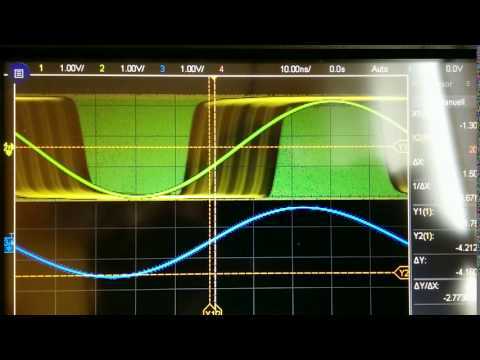 From the gain curve it can be seen that the device is probably not working that well at the lowest end of the shortwave. But at least from 30MHz on it should be usable. 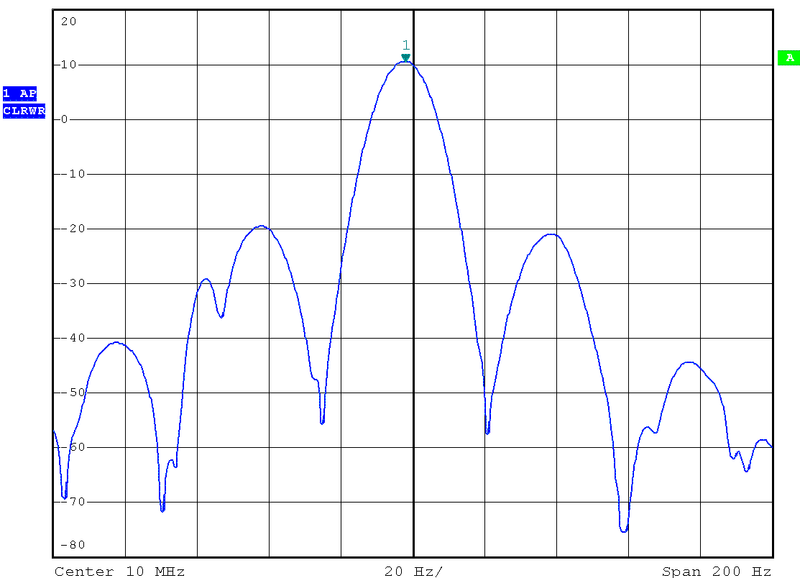 Towards upper frequencies the gain is decreasing a lot but still 27dB at 700MHz. 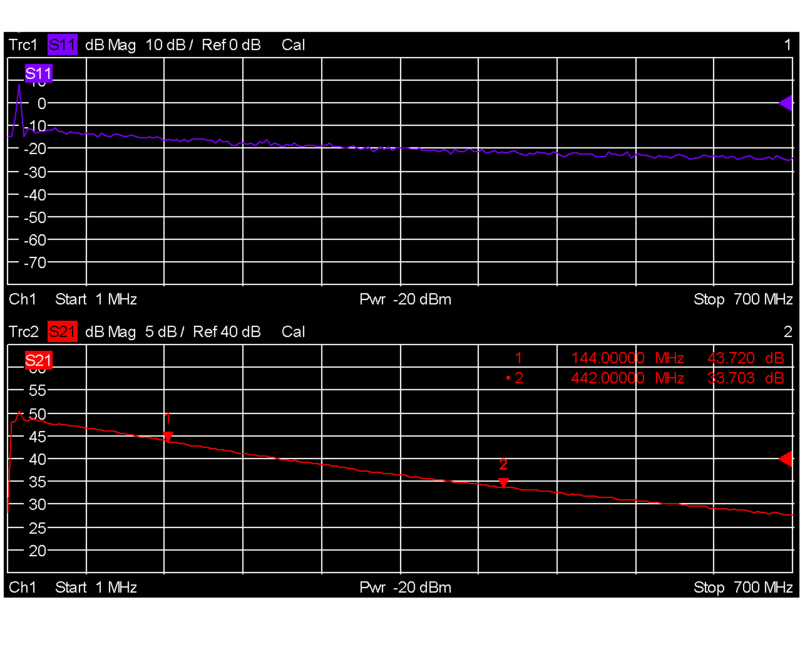 For the 2m band roughly 43dB gain is achieved and about 33dB in the 70cm band. 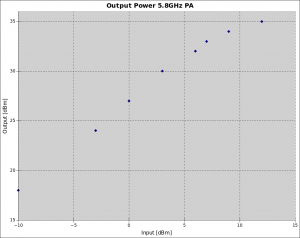 Finally i wanted to know which output power can be achieved in the amateur radio bands. At about 1W output the output always gets compressed. 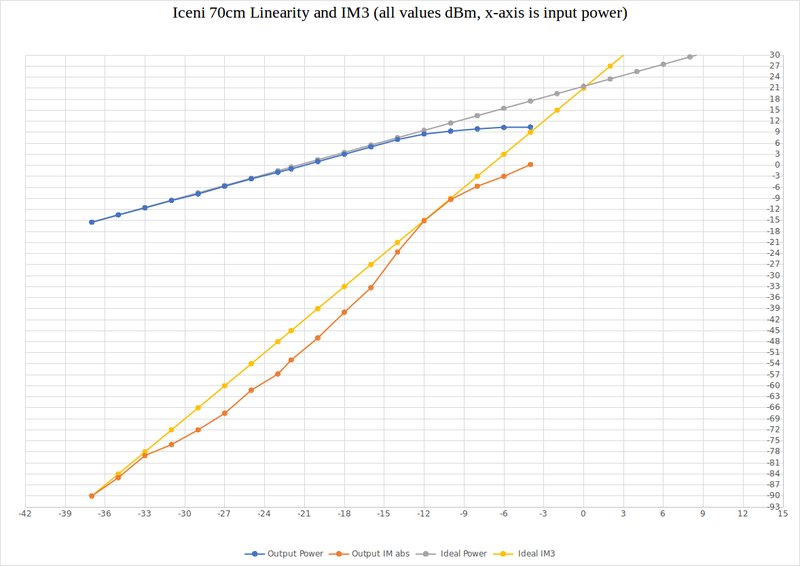 You might add about 0.4dB on 70cm and 0.3dB on 2m to my measurements since the graph does not include the attenuation of the output cable. For me it means that the amplifier should work well for my purpose. 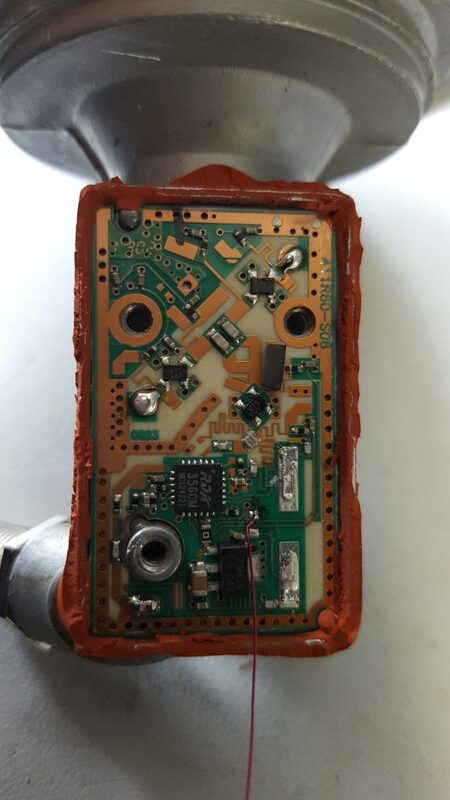 Some posts ago i wrote about my new 6cm transverter. I already did a few QSO and i got a 10W PA for a good price. 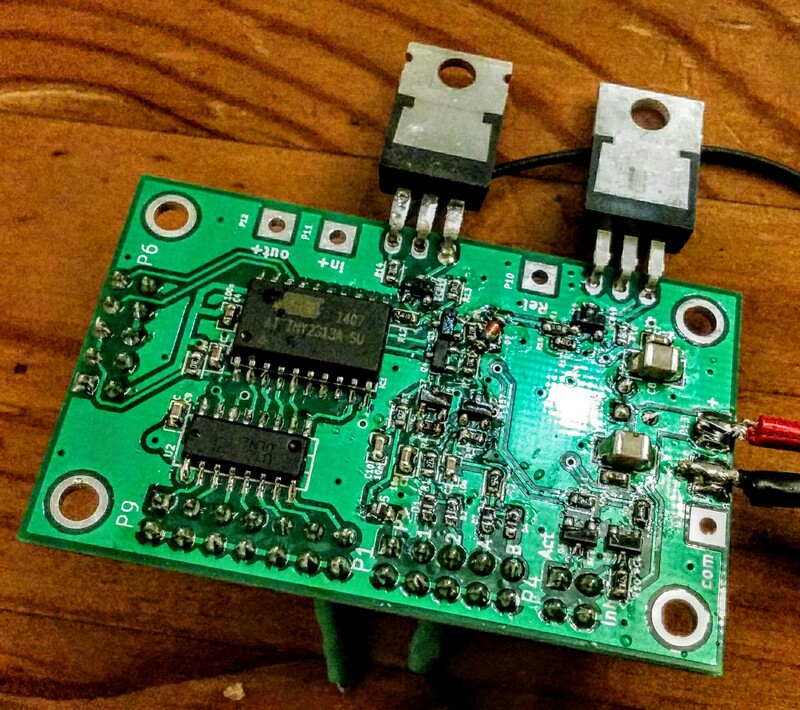 Unfortunately this PA needs 1W of Input and the transverter gives maximum of 250mW output. So a small “driver” is needed. I was researching the options but found no easy solution that also fits my budget constraints. Then i saw some amplifiers sold as WLAN amp. Usually those are for 2.4GHz but i thought if there are some for the one band there are probably also some for the 5GHz band. During the search i found the nice Amp on the picture below that is sold as an amplifier for video transmissions for about 22Euro. It is specified with 3.5/4.5W. But whatever output power for the price i thought i cannot do wrong a lot. After removing the soldered shield on top of the PCB one of the screws for mounting the heatsink also came out. 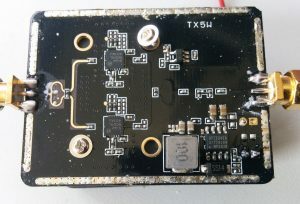 The semiconductors used in the PA are 2x Skyworks SE5004L with a P1dB of 30dBm typical and 34dBm max. So i thought 2W should be possible at least. The gain is specified with 32dB. At the input of the PA is a pi-attenuator. Later i soldered some nice SMA jacks and then the PA went to storage for quite some while. 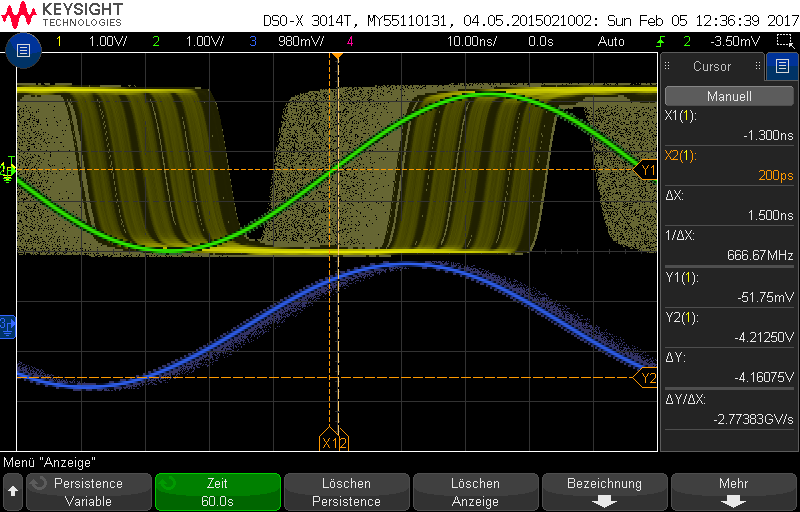 Now i found some minutes to remove the attenuator and do some raw measurement of the output power. 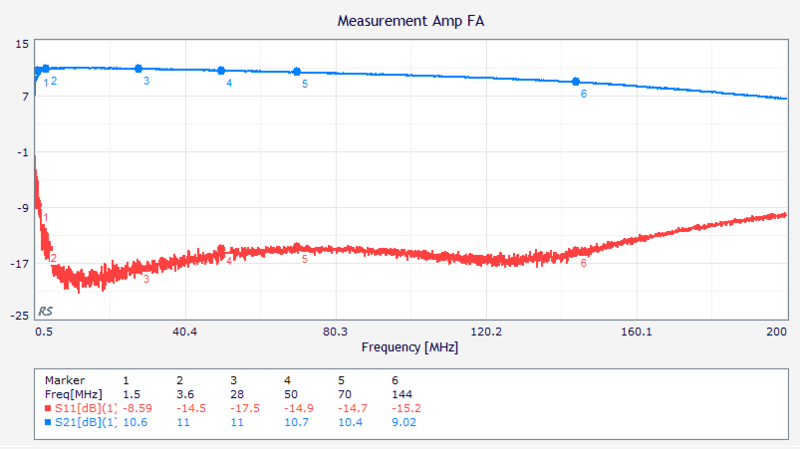 The gain of the amplifier is about 28..29dB. I did not measure the cable attenuation exactly so do not nail me down on the last dB. The input vs output figure you can find below. 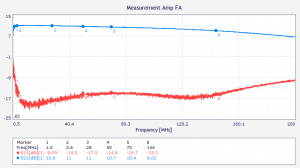 The P1dB is about 2.5W. So considering the samples to be typical there is quite some loss on the PCB. But even in that case for the given price its a nice thing. I tested my new assembled wideband high IP amplifier (BX-088) from Funkamateur. The transformers need to be handmade which is a very fiddling task. The cores are really small. I choose for 11dB gain assembly. The measurement shows, that the gain really rapidly drops below the 160m band. The figure fits to what is shown in the documentation. So far i did not measure the p1dB or IM3 behavior. The points that are interesting for me are 28MHz as LNA for my SDR or as IF amplifier for transverter input on 14/28MHz and usage as pre-amp for 70MHz. 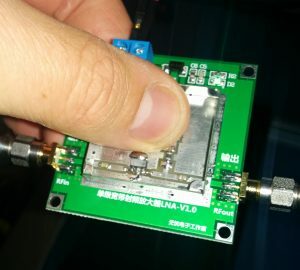 I was searching for some simple LNA for microwave reception and found a very cheap board from China. 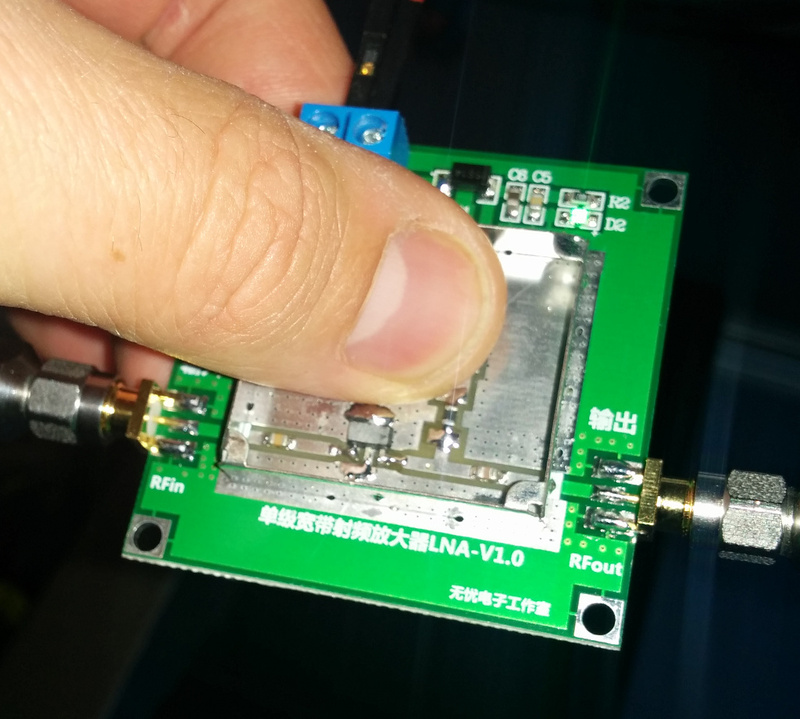 For less than 10 Euro i ordered a LNA board that is specified to work from 50MHz to 6GHz. 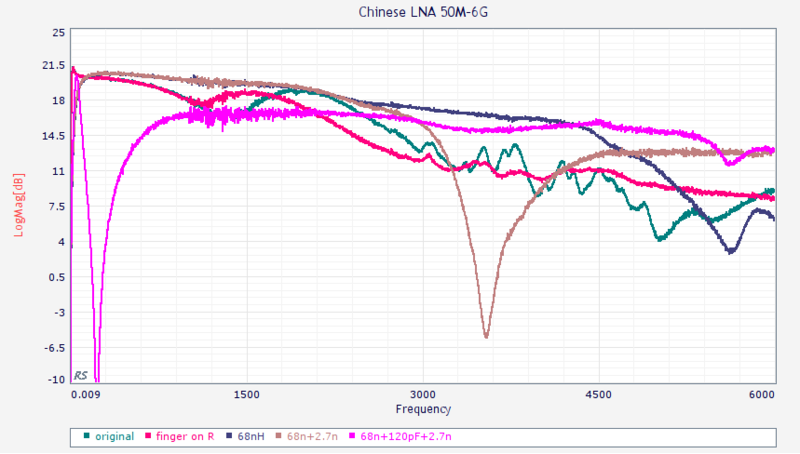 The gain should be about 20dB at 50MHz and still >10dB at 6GHz. Even if it does not work like that the PCB with shield and SMA jacks is still a good deal. You can find some measurement results below. The original condition makes clear that the gain on the upper frequencies is not good. Touching the bias network with the finger showed slight improvements. So it was clear that there is some problem with the components feeding the MMIC. Exchanging the ferrite bead by a 68nH RF coil gives much better results up to 4.5GHz but still has problems on the highest frequencies. 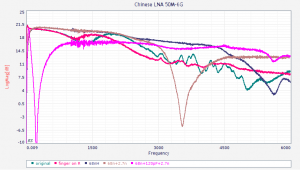 So i tried a 2.7nH i series directly connected to the RF trace in order to avoid the stub that was there before. Now 6GHz is good but there is a resonance at about 3.5GHz. My last attempt was an additional 120nF to ground between the two coils. Thats pretty promising for the microwave bands but below 800MHz the LNA is not usable anymore. So the network still has room for improvement but it is at least clear that the board is usable. Attiny2313 + Uln2003 + highside FET switch for PA + lowside FET switch for RX-TX relais and a few bipolar Low Power stages on a two-layer board. The PTT input can be either high-side or low-side active. It also has lock input to connect several transverter to one antenna system. Via the driver IC a pulse relais and a fan can be controlled. 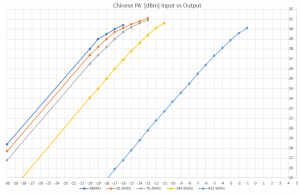 There is also a Tx inhibit output that can be used with Yaesu tranceivers. The circuit has two PTT inputs and two Error inputs (decoupled by diodes). A active high PTT input is available as well. There is a highside FET switch that can be used to drive a PA and a lowside FET switch that can be used for an RX/TX relais. 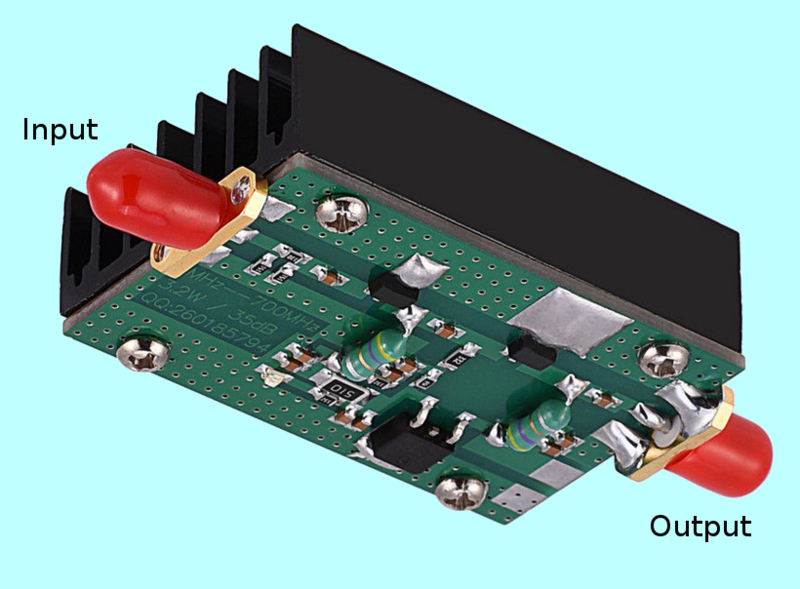 The TX inhibit signal is available to drive the inhibit input of Yaesu transceivers. The active out is used to signal a sequencer in TX mode. 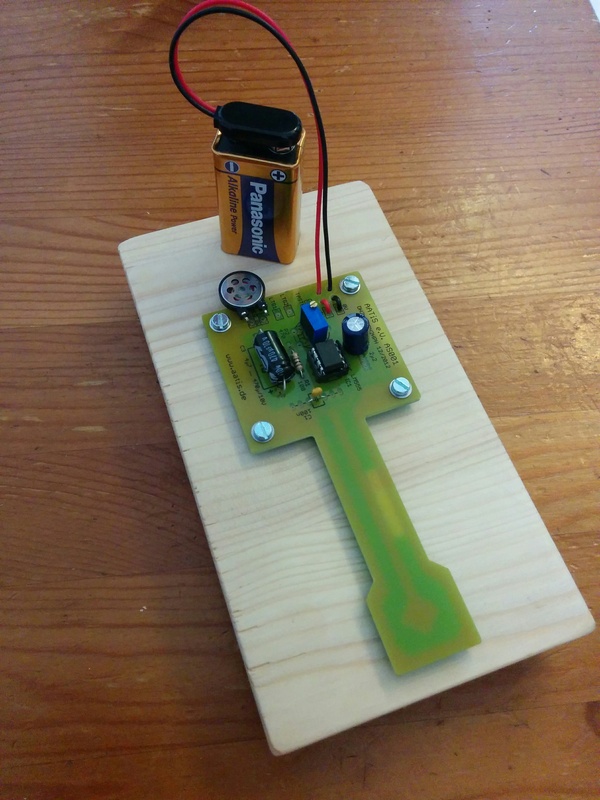 This can be used to lock other sequencers via the error input. 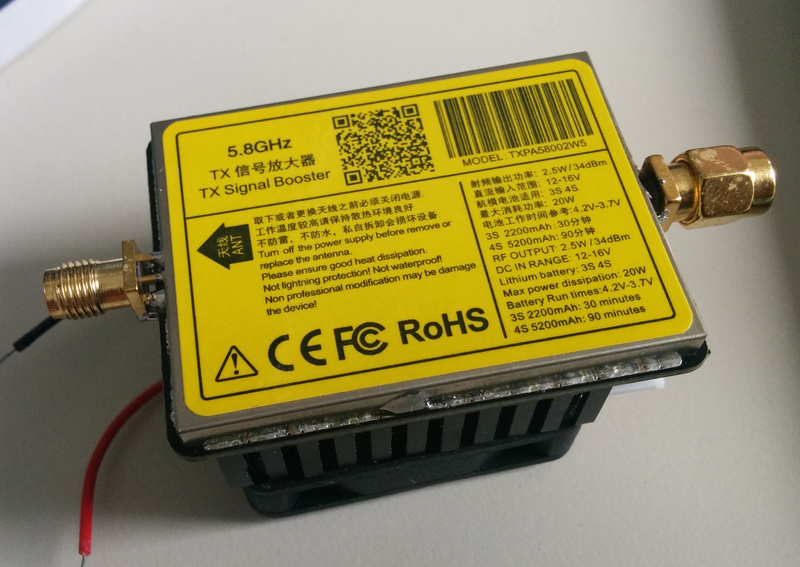 The ULN2003 driver is currently configured for another RX/TX relais, a fan which is running until 30s after releasing the PTT, another low active signal parallel to TX-inhibit (as PTT for TRX without TX inhibit) and output signals for a pulse relais (bi-stable RF relais). The serial interface (also used for ISP) is unused in the application. 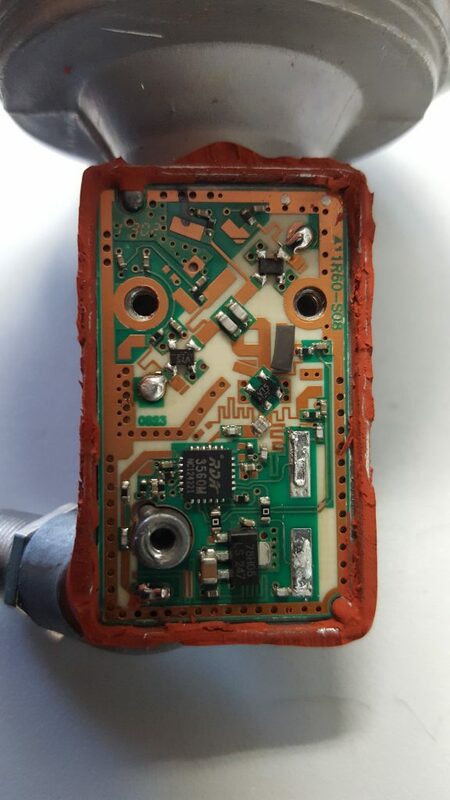 It might be possible to connect a temperature sensor for example. The missing connection from Q4 to R7 is a print error. 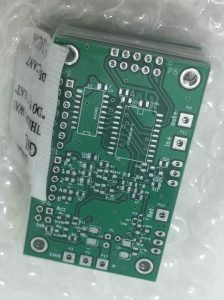 The design was done with KiCad which is a open source PCB layout system. The code for the microcontroller was written in C. The 2k program memory are almost full now but one might be able to optimize. If you are interested in the design data let me know. I also have some spare PCB left over. I wonder what else could be implemented with this PCB with the small program memory size. Feel free to give some ideas. Since some time i own a DF9NP GPSDO. Currently i only use it to lock my signal generator but i also want to use it for my microwave transverter OCXOs. 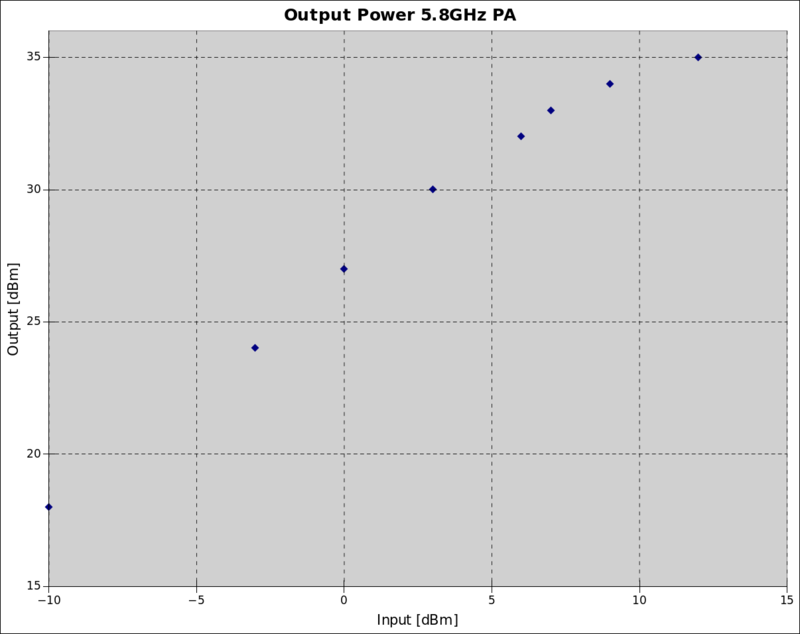 When connecting a SMIQ signal generator and checking the signal output at 6GHz i noticed some +-50Hz jitter under the poor reception conditions at thelocation of this signal generator. So i want to look a bit closer into that topic. 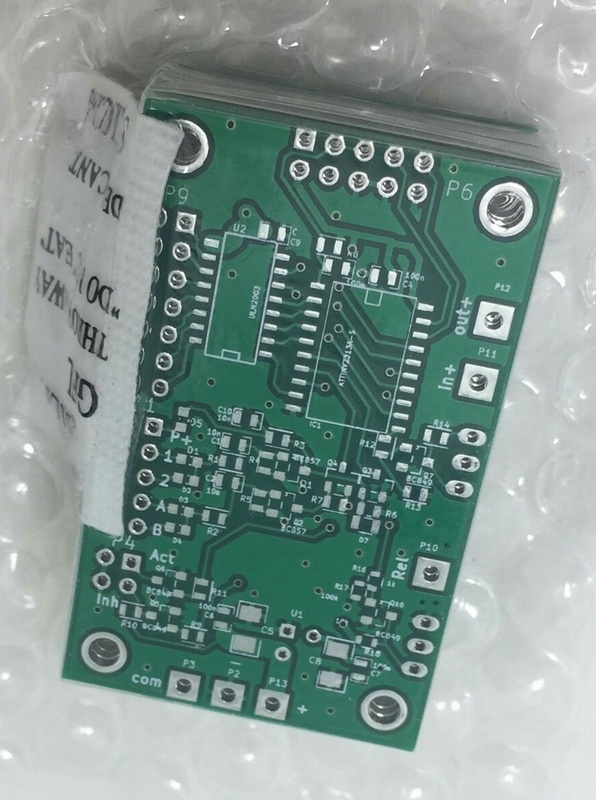 In China i ordered a Neo-M8N module that can be configured to provide a 10MHz clock at its timepulse output. 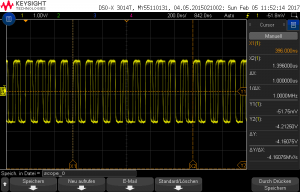 I tried to compare it with the GPSDO and the OCXO of my SMY-02 signal generator. Of cause the digital clock has significant jitter because it is generated by a CPU (specified with +-10ns). The picture of the timepulse at 10MHz shows, that it seems that comparing the clock to a stable oscillator over a relatively short period could be sufficient for adjusting the frequency of this oscillator to the GPS. 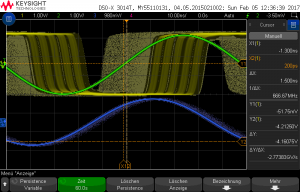 The screenshot shows the oscilloscope triggered to the GPSDO (green). 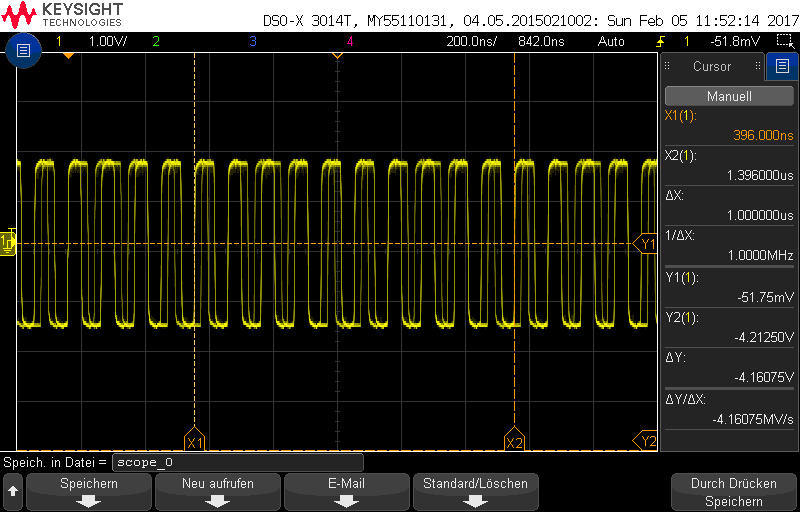 The output of the M8N module (yellow) shows the jitter and the adjustment range within 60 seconds (yellow shadow). The third (blue) trace comes from my SMY-02 which was locked to the GPSDO. The SMY signal shows some slight jitter compared to the reference. To me it is not clear if the cause is the reference or the locking in the generator. 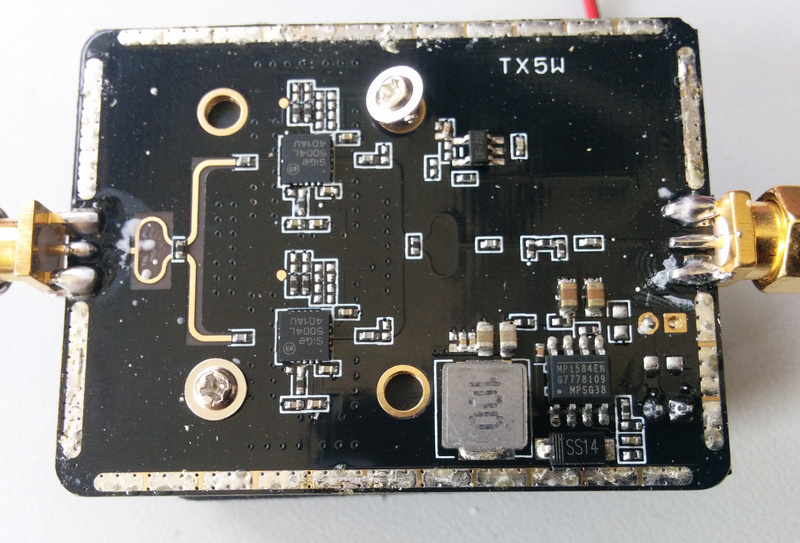 The clock from the M8N module shows significant adjustment of the clock frequency within the 60 seconds shown compared to the GPSDO which has a TCXO that is slowly compensated by the GPS inside the reference. There are rather close sidebands that require narrow band adjustment of a oscillator eventually locked to this GPS clock. Wideband the spectrum is noisy as well. Finally i took a short video showing the the scope triggered to the 10MHz OCXO reference of the SMY and comparing the GPSDO and the M8N output. 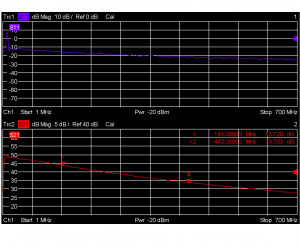 The OCXO is slightly off 10MHz and therefore the picture is moving all the time. You can also see that the M8N is slowly adjusting compared to the GPSDO output.